As you are trying to figure out how to make your transition into self-employment you inevitably will get stuck. I’m digging back into my podcast archives to share with you a fun and unique exercise to help you visualize your career goals. It’s called sketchingnoting. I like to think of it as doodling with intention and without judgment. Doug Neill has made a business out of sketch noting. In graduate school, he rediscovered his childhood passion for drawing. He was a math and science teacher, but sketch noting helped him realize the traditional teaching path wasn’t for him. You can check out some of his work at The Graphic Recorder or Verbal to Visual. Why Doug has been aware of his need to go through a transition every couple of years. 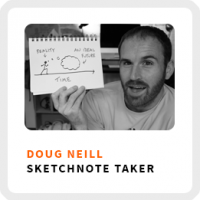 How he first started getting paid for his sketch noting work by being hired for freelance projects. How a TED talk inspired him to take action by immediately buying a domain name and starting a website. Aligning your habits with your purpose. Superpower: Recognizing times when he needs to make transitions. Self-reflection practice: Paying attention to the alignment factor to remain on track with your goals. Regains focus by: Applying some constraints to what he’s working on. 90-day goal: Continue to build teaching resources through Verbal to Visual, The Graphic Recorder, and A Trail of Life. 1. Buy a sketch notebook or gather up a bunch of scrap paper you have around your house. 2. Keep your sketch paper and a pen or pencil in place you will feel most comfortable drawing each morning. 3. Make sketching your thoughts a part of your morning ritual. You might even make drawing the very first thing you do every day. 4. Try this experiment for at least a week to see how it makes you feel. Who knows, you might even learn something new about yourself.